Parkinson’s disease is a kind of neurological movement disorder affecting a large number of people throughout the world. It starts with the cells of the brain called neurons which carry out the task of controlling movement. The neuron produce a substance known as dopamine. When dopamine levels in the brain decrease and when the neurons die, PD sets in. Complete insufficiency of dopamine in the brain can result in symptoms affecting an individual’s movement. 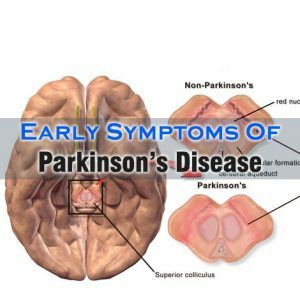 Early Parkinson symptoms can be missed very easily since they occur sporadically. Nevertheless, if you notice regular symptoms, it is time for you to consult a doctor. Shaking or tremor in the thumb, the fingers, chin, lip and hands is one of the most common early Parkinson symptoms. People affected by Parkinson’s disease might also find their leg shaking when they relax or sit down. Shaking or twitching of limb is also one of the common early signs of Parkinson’s disease. Sometimes, the handwriting of the affected suddenly gets very small than it actually was in the past. An individual might notice that he or she has changed his or her way of writing words on a page like the words can be crowded together or the letters might be very small. Individuals affected by Parkinson’s disease lose their ability of smelling certain foods very well. They find it very difficult to smell foods like licorice or dill pickles and bananas. Extreme and sudden movements while sleeping such as punching and kicking and even falling out of bed are some common early symptoms of Parkinson’s disease. People with Parkinson’s disease might also notice tightness in their elbow, knee or hip and their wrist. The uncontrolled tightness might cause severe or mild pains or aches making it very difficult for the affected to move around.